Make this deliciously creamy and light cheesecake filled with fresh blueberries, that comes together in less than 30 minutes, a perfect dessert for any summer occasion! One of my favourite things in summer, besides the long sunny days and balmy summer nights, is the big variety of fresh fruit one can find at the farmers’ market! I looove the abundance of strawberries, raspberries, blueberries, red currants, black currants, cherries, peaches and apricots, just to name a few. At our weekly Saturday morning trip to the farmers’ market I usually don’t know when to stop, and end up buying so much fruit Boyfriend always thinks we’ll have to throw it out before the week’s over. But he’s wrong: somehow having so much fruit at home makes us eat more, and usually by Wednesday night/Thursday morning there’s no more left in the fridge. Of course besides eating fresh fruit straight from the bowl, using it for chilly soups and desserts is another great way to make the most of summer…. An easy yet unusual and extraordinary combination of juicy strawberries filled up with lavender infused coconut whipped cream, a light yet unforgettable summer dessert treat, that adults and kids alike will devour. The past weekends I got busy, not wanting to miss out on much: I made layered strawberry cream cheese dessert, vanilla strawberry-rhubarb jam (that was so popular with anyone who tasted it, that I had to make another batch with elderflower and another with lavender – recipes to be posted soon, until then, you can find all recipes with strawberries here). So I was busy making the most of the boxes of strawberries I bought, yet I wasn’t tired of strawberry. I was up for tasting another strawberry themed treat but after so many hours spent in the kitchen I was looking for a quick and easy to make dessert. 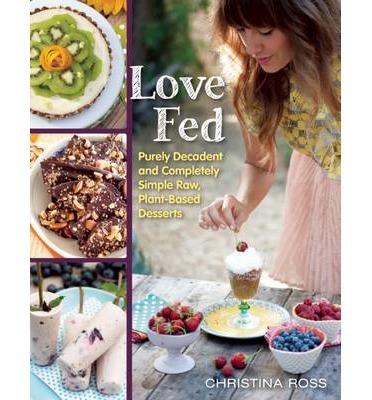 I looked for inspiration in Christina Ross’ Love Fed, which feature “Purely Decadent, Simply Raw, Plant-Based Desserts”. Let me tell you that I spent a good time reading through the recipes and looking at the gorgeous photos, and though there are many recipes I have bookmarked to try out later, this time I decided on Christina’s lavender coconut cream-filled strawberries as they filled the bill to perfection: the perparation didn’t take long, I had all the ingredients at home and the combination of the different tastes weas too tempting, I had to try it. And I have to say the tartness of the strawberries with the creamy sweetness of the coconut cream spiced up with the fragrant lavender blossoms was definitely an extraordinary yet simple dessert. You can use any left-over cream as a special flavoured whipped cream, it will complement brownies or fruit tartlets/crisps wonderfully. Another variation I could see once the weather turns truly hot: mix cut up mint leaves in the coconut cream to add some icy freshness to the mix! 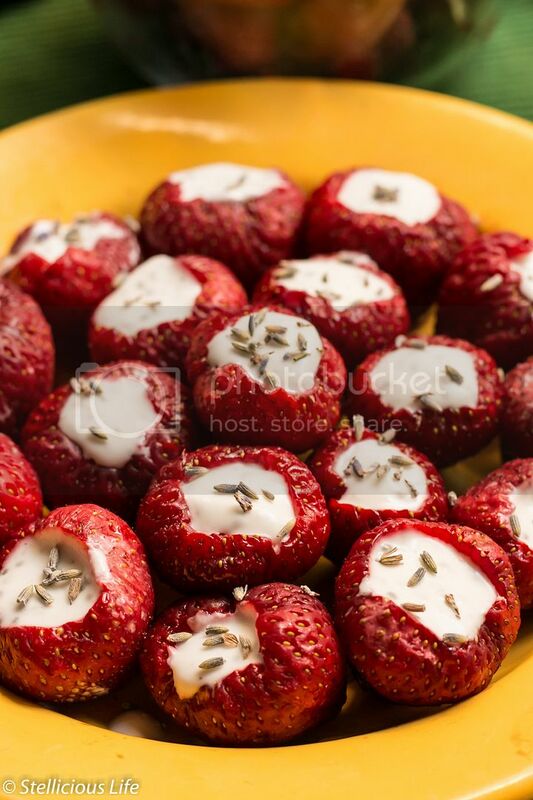 An easy yet unusual and extraordinary combination of juicy strawberries filled up with lavender infused coconut whipped cream, a light yet unforgettable summer dessert treat, adults and kids alike will devour. Wash and hull the strawberries, then set them aside on a plate. Pour the chilled coconut cream in a bowl and beat it with your mixer in low speed until fluffy (for the best results chill the coconut cream for a few hours or even overnight, and chill your bowl and mixer as well). Once the coconut cream is almost whipped, add the vanilla powder, coconut sugar and lavender blossoms and beat until well incorporated. Fill a pastry bag with the cream and pipe enough cream in the hulled out strawberries so some cream pokes out at the top. Garnish with additional lavender blossoms, cacao nibs or black chia seeds if you wish. May be served immediately or stored in the fridge for up to 2 days. Adapted from Christina Ross' Lavender and Coconut Cream-filled Strawberries recipe featured in her Love Fed cookbook. I received a review copy of Love Fed via NetGalley, my opinion of the recipe and the cookbook are purely my own. I plan on making a bit more detailed review of the cookbook soon. You can buy Love Fed at most retailers like Amazon and Book Depository (free international shipping!). One of my favourite things in summer, besides the sunny days and balmy nights, is the abundance of fresh and colourful fruit one can find at the farmers’ market. Every Saturday morning it is a joy and has become one of my favourite ways to grocery shop to peruse the stands at the market and like a butterfly flying from flower to flower browse along the lines and sellers. 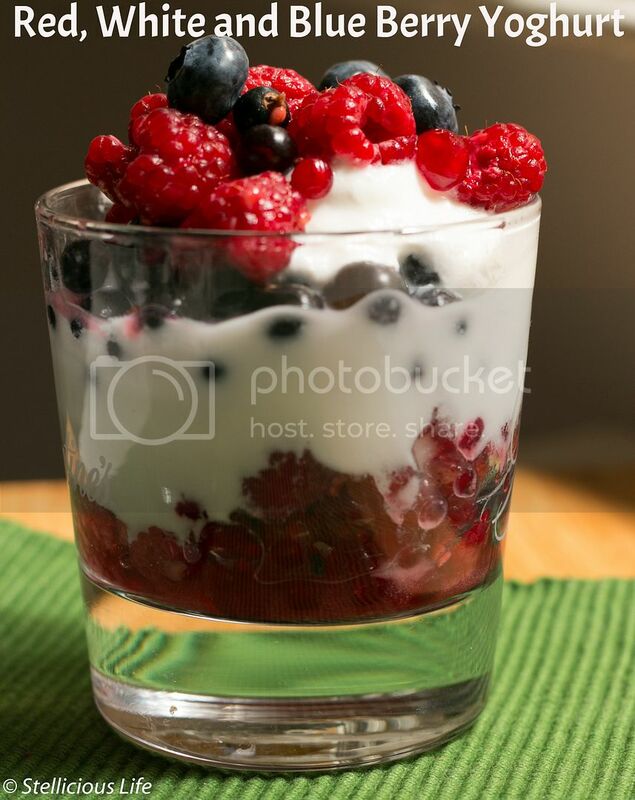 My only problem is that I am a real food-glutton as I want more and more: this Saturday I bought raspberries, strawberries, blueberries, cherries, sour cherries, red- and black currant and some rhubarb….